The home page displays your vehicle(s) on a satellite map. The information box, showing vehicle information will already be opened, unless you have multiple vehicles. 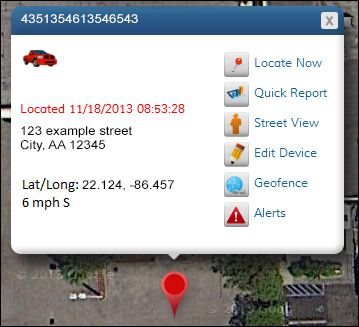 In that case, click on the appropriate red pin to see vehicle information. By hovering over the red pin, the vehicle name will appear. The information box displays your vehicle’s name, serial number, address, latitude and longitude, time of last report, speed and direction. This entry was posted in Navigating the Map on March 18, 2014 by .